I became interested in reading this series after watching the trailer for the upcoming Netflix series. It looks very fun and Wes Anderson-esquely quirky. So, I figured it was a good excuse to read the graphic novels first. In a mysterious worldwide event, forty-seven women, most of whom had not shown signs of pregnancy, gave birth. Of these children, millionaire inventor Reginald Hargreeves, AKA the Monocle, managed to track down and adopt seven. His reason for collecting the children? “To save the world.” The children are gifted with powers that they use to fight villains and save the day, though it seems that their upbringing leaves something to be desired. Twenty years after saving the world from a murderous Eiffel Tower controlled by zombie robot Gustave Eiffel, the Umbrella Academy returns home for their father’s funeral. Number 1, Spaceboy, AKA Luther, is basically the leader and has powers of strength. He spends most of his time in outer space with his robots. The Monocle forced him to have his head attached to the body of a gorilla after an accident (I’m not sure when that happened- it wasn’t in the books, I read it online). He has a thing for Allison, but thinks she wouldn’t love him because of the gorilla body. Number 2, the Kraken, AKA Diego, tends to fight with Number 1 and is sort of abrasive in general. He spends his time underwater and can hold his breath a long time. He does have a thing for Vanya. Number 3, the Rumor, AKA Allison has powers of manipulation. We learn that she was married and has a daughter. Number 4, the Séance, AKA Klaus can communicate with the dead, possess people, levitate, and move objects with his mind. He is very goth and kind of dramatic. Number 5, AKA the Boy, disappeared after the Eiffel Tower incident. He emerges at the funeral looking the same age he was back then, claiming to have travelled through time and seen the end of the world. He took a very long time to figure out how to make his way to the past to warn them, and though he aged normally in the future, when he returned to the past he was ten years old again. He is very fast and very violent. Number 6, the Horror, AKA Ben, passed away at some point…or did he? Number 7, AKA Vanya, is the only child without powers. Because of this, she was treated differently from her siblings, not special. As an adult, she wrote a memoir about growing up like this, My Life as 00.007. She is a talented violinist and is asked to play with a Orchestra Verdammtem. At first she turns them down, but after a disastrous meeting with her siblings, she changes her mind. Vanya is turned into the White Violin, who can kill with a single note, and will be used to bring about the end of the world. 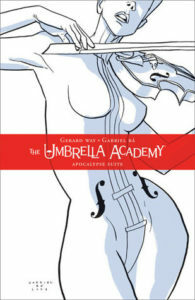 I liked The Umbrella Academy, but I can’t help feeling as though I’m missing parts of the story. It feels a little like this was an established series that expects you to have some prior knowledge coming in, but it’s actually a new thing. There’s still a third volume coming out later this year that might improve things, and I’m definitely going to check out the show next month. You can visit my post in its natural habitat at my (neglected) blog here. Hopefully I will be able to complete one review a month…I will be happy to do just one a month.